Summertime is packed with trips to the playground and the amusement park, but there is one ride you don't want to find children on – the summer slide. The summer slide may sound like a carnival attraction, but the cute name hides a grim reality. Low-income students, despite making as much progress during the school year as their more affluent peers, lose ground in their reading skills over the summer months. This achievement gap was studied in depth by Johns Hopkins researchers, and they felt the summer slide could be explained by unequal access to summer learning opportunities during elementary school. 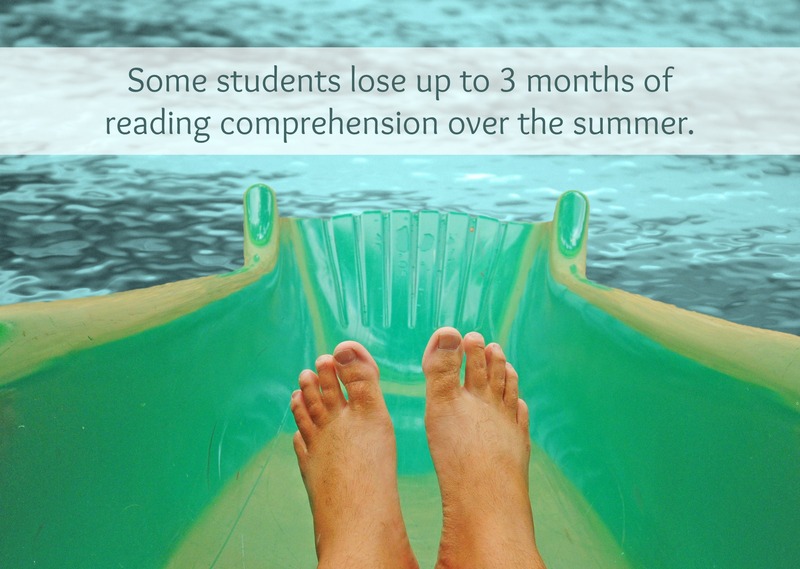 These students lose as much as three months of reading comprehension over the summer. By the end of fifth grade, they are nearly three grade levels behind their peers. Study after study shows a direct correlation between poor reading ability and success in both school and life. This achievement gap can make the difference in whether students stay in school and go to college. Ultimately, poor reading ability can affect their communication skills, cause lower self-esteem, and result in lower average lifetime wages earned. The emotional, financial, intrapersonal, and interpersonal impact of poor reading ability cannot be overstated. Fortunately, the summer slide is avoidable! 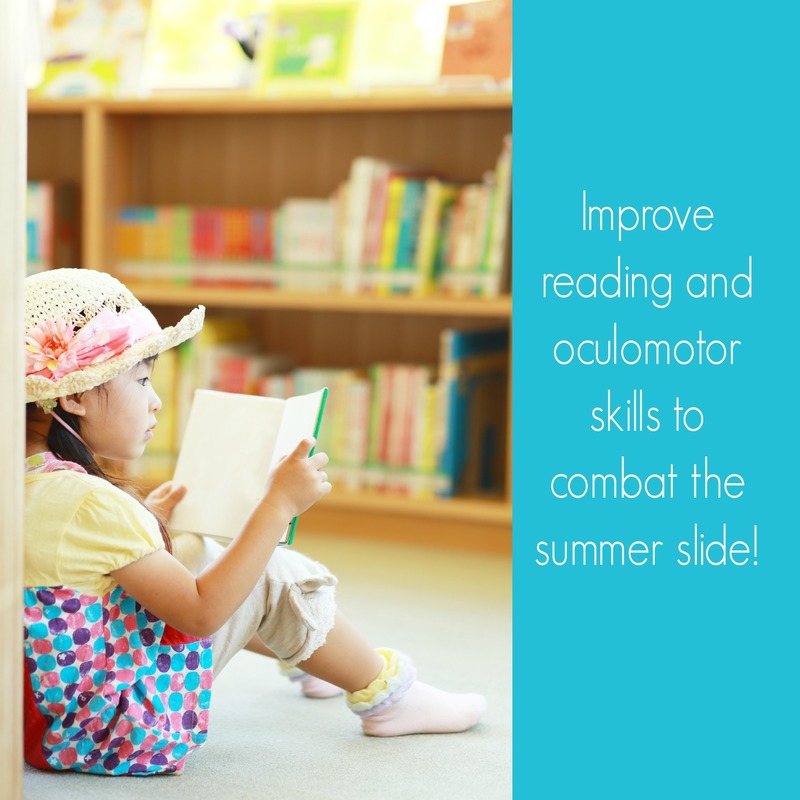 And in fact, with all of the extra time summer provides, summer is actually the perfect time to improve reading and oculomotor skills! But spending time reading is only one piece of the puzzle when the goal is to improve reading habits and ability. If a child has visual perceptual and sensory deficits, they may struggle as a reader and as a student. If a child is exhibiting signs that they are experiencing visual issues, such as sitting too close to the television or holding a book too close to their face, squinting, tilting their head to see better, rubbing their eyes even if they aren't tired, or if they're demonstrating difficulty with eye-hand-body coordination when playing a sport or riding a bike, they may be experiencing a visual deficit. A behavioral optometrist can assess the child and help resolve any visual issues. Qualified behavioral optometrists can be found using the Locate a Doctor feature at the College of Optometrists in Vision Development (COVD) site. Children need both basic and advanced reading skills to be successful in school and life. Help prepare them for their first (or next) year in school by following a daily summer reading program, having them evaluated by a behavioral optometrist if they might be experiencing a visual problem, and practice developing visual ability at home. But students want to relax in the summer! They want a break from doing work! How in the world can you get them to practice visual skills at home? This is where a crucial component comes into play – it has to be fun! A simple way to make learning fun is to turn the work into a game. In the PuzzleArt Therapy System, games and fun are built-in to the very design. While the products and exercises are all enjoyable and look deceptively simple, every level of products can help people of all ages with oculomotor, perceptual, and sensory challenges. It's the best kind of learning – the kind you don't realize you're doing because you're absorbed, challenged, and engaged! It's learning that's irresistible. Here is a Level One exercise from our PuzzleArt Alli Activity Books: Challenge Edition 1. Have your child complete the entire activity every day for five days. Remember: this is a game – a game that will help develop oculomotor and perceptual skills – but it is still a game (and games are fun!). Take unobtrusive notes as your child completes the activity – note the date, record the start and finish times, and jot down any obvious difficulties. This list can then help a professional when evaluating your child. Take action today to halt the summer slide in its tracks! Stand Up for Brain Fitness! Are you sitting down to read this? You might want to change that, right now and throughout your day! According to new research, sitting is the new smoking, but you're probably offered a seat far more often than you're offered a cigarette (does that even happen anymore?). In fact, we're kind of obsessed with sitting in this country. As soon as you walk into someone's house you’re asked politely, “Would you like a seat?” You get on the subway and immediately scan for an open bench. You spend the day sitting in your office chair. On the weekend, you catch a movie in a theater that has been renovated with seats that recline, and once you get home, you plop into your comfy armchair. 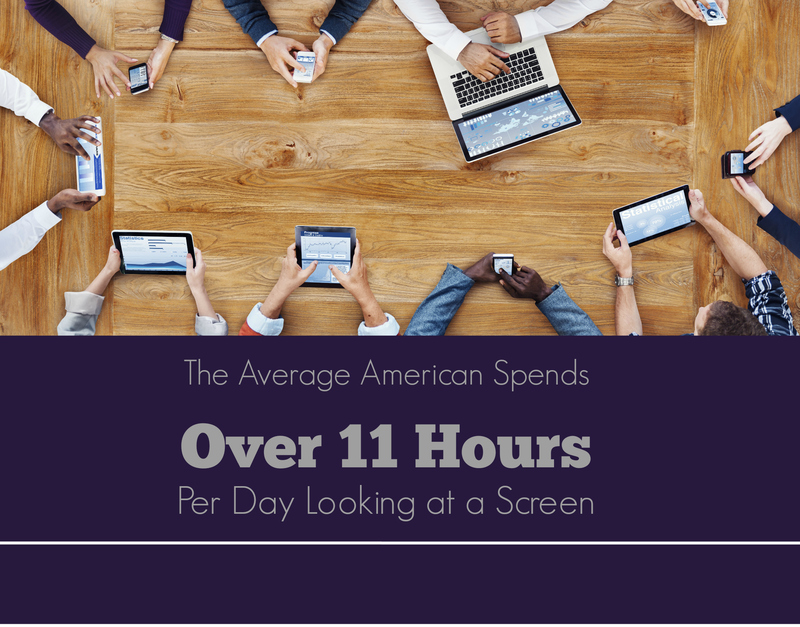 We're in a sitting epidemic, and it's bad for our bodies and our brains! It's time to stand up! The amount of time a person sits during the day is associated with a higher risk of heart disease, diabetes, cancer, and death. Many combat this by hitting the gym before or after work, trying to work in their 30 minutes of cardio, but research has now shown that sessions of vigorous exercise don't actually make up for hours spent on your bum. Increasing physical activity doesn't mean you have to join a Zumba class before work (though it's great if you do!). Physical activity needs to be maintained throughout the day to increase oxygen flow to the body and brain, and working in a standing position does just that! It has a positive impact on work performance, creativity, and health in general. But maybe you're thinking that standing all day just isn't feasible for you! That's ok – there are a lot of ways to increase the time on your feet throughout your day. This week, do your brain a favor and set the alarm on your phone to go off once an hour. Use that reminder to stand up for brain health and longevity! For even more brain fitness, sign up for a free brain game to help you create your best day! 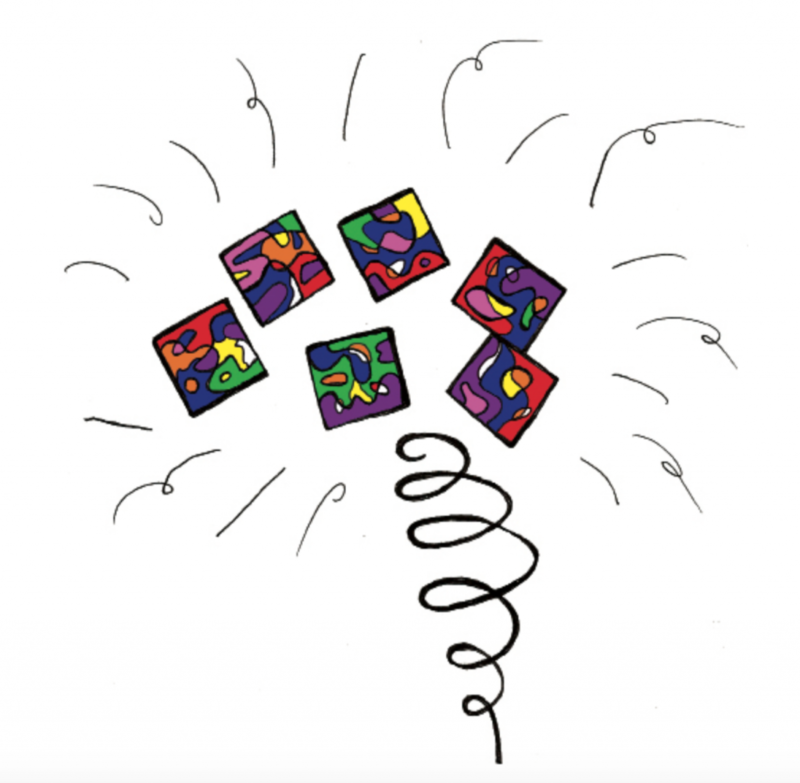 The basic PuzzleArt Therapy System has three levels, each with several modules that help participants learn, develop, and refine a variety of skills. The levels are set up to move the participant from simple to more complex challenges, though each level and each exercise within the levels can be repeated over and over, without the risk of it becoming boring or repetitive. This is a result of the open-ended format of PuzzleArt Therapy. While there are specific directions that teach the eyes and brain to look for connections, paths, and ways to solve problems, there are no specific right or wrong answers, but instead, a plethora of potential solutions waiting to be discovered! The goal of the level one modules is to familiarize one's self with the PuzzleArt pieces, relate more closely to them, and practice working with them while developing solid breathing and relaxation practices. Through the exercises in this level, participants will first become oriented with the PuzzleArt pieces, and will be guided through exercises that help them make connections between colors, shapes, lines, edges, as well as providing them with an opportunity to manipulate the pieces to form their own patterns and designs; becoming a visual artist right from the beginning! Participants will be making these connections in a way that unifies physical movements with visual tracking. Neural pathways will be developed and strengthened while they settle in with the mesmerizing PuzzleArt pieces that are just irresistible – they are made to be touched and that is exactly what participants will want to do! As they work through the levels, participants will be challenged to break away from the obvious connections and find more subtle associations, ones that might even seem to “break” rules they didn't even realize they were attempting to impose (for example, connecting the pieces in a way that lines, colors, or textures align but in which the actual pieces don't square up – it sounds simple, but you'd be surprised at how many people think squares must be evenly lined up with each other in order to be “right!”). The level two modules are dynamic and creative. 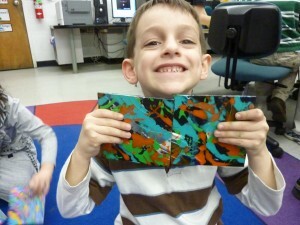 As participants move deeper into the PuzzleArt universe, they will learn how to expand their creative horizons. This level guides participants through a process that helps them see the pieces instead of just look at them. It then takes them through guided exercises to examine what they see, and observe how that changes as they follow the exercises. They're then taken through a series of questions that prompts them to critically evaluate and synthesize both what they've seen and the process they've gone through. We continue to develop guided relaxation and breathing techniques in this level, as well as adding in more whole-body movements that strengthen bilateral skills. The level three modules deal with feelings and emotions related to the colors, shapes, textures, and lines of the PuzzleArt pieces, but more deeply, it is about recognizing the value of owning one's emotions, viewpoint, and perspective. Challenges in this level have the participant literally take on a new perspective of the PuzzleArt Pieces, from changing their position in relation to the pieces, changing the piece's relationship to the viewer, and changing how the viewer uses their eyes to see what they're working on. 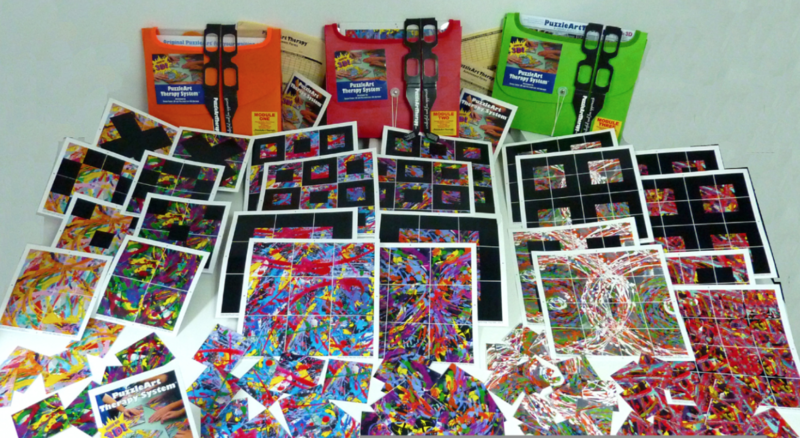 Sign up today for a free brain game, and get a glimpse of what PuzzleArt Therapy is all about! Whether you are trying to resolve the national debt or manage your own finances, eradicate poverty or modify your diet and exercise routine, your problem-solving skills are put to the test on a daily basis. With all of this constant decision making happening all around us, one might think we would all be experts at problem solving, from the big issues to the mundane. But just because we do something a lot – make decisions, solve problems – doesn't mean we're any good at it or that we're getting any better. Doing something over and over, the same way you've always done it, is likely to garner the same results. The problem here is that precedent and experience often guide us, and so we continue to see problems from a familiar angle. Sometimes, we need to turn the problem on its side, stand up and look at it from above, walk away from it and come back with fresh eyes. The global issues facing society today require skilled problem solvers: people who see the problems not as something to cover up with a bandaid, but as opportunities – opportunities for change, for growth, for communication, for health, for profit, for all sorts of things! But ultimately, as opportunities – not simply as something to be dealt with, burdened by, or weighed down under. In order to look at issues with that unique perspective, we need to develop divergent thinking that helps us evaluate all the angles of an issue from a variety of perspectives and create a myriad of possible solutions. This is in contrast to the very concrete, linear way many of us have been taught to problem solve. We often look at a problem, logically examine it, and seek to identify the right answer – the one solution that is correct. We are taught this in school over and over. Remember when the teacher would ask a question and you would raise your hand and wave it frantically, confident that you had the correct answer? Or recall all of the standardized tests you've ever taken, perhaps starting with the Iowa Test of Basic Skills as a child, the SATs as a high school student, or professional exams such as the Praxis as an adult – all of those tests require an evaluation of a problem and the identification of one correct answer. We have become quite skilled at this model of convergent thinking, but this process teaches us to come to the same conclusions that someone else has already reached. Instead of searching for an answer someone else has already identified, we must become more creative in our problem solving. We must reach beyond what has already been done, and find new ways to solve problems. 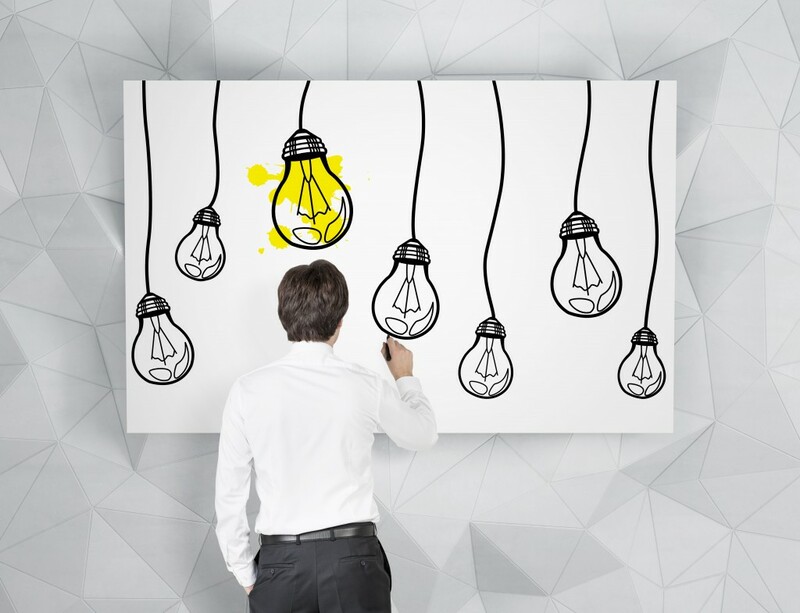 Divergent thinking is typically much more free-flowing and spontaneous, with a goal of generating as many solutions as possible, and making connections between ideas that might not have been made before. 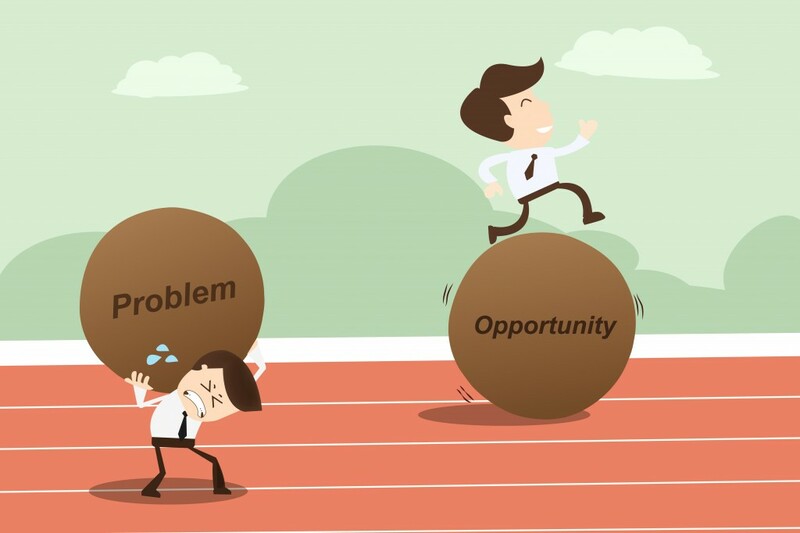 It is to approach the problem without the idea of looking for a single, absolute solution, but instead looking at the problem as many opportunities to be explored. This sort of problem solving skill must be cultivated as it doesn't come naturally for most people. PuzzleArt Therapy provides a format to learn this incredibly important skill. It provides a process to evaluate problems from different angles, teaching participants to notice patterns and connections that might not have been immediately obvious, and the process is open-ended. There are no right or wrong answers, but instead, many solutions, and many paths to reach those solutions. Think about the great innovators of our time, people like Nelson Mandela, Steve Jobs, Warren Buffet – leaders in social movements, technology, business – they all worked to solve complex issues in new and innovative ways. They were not searching for one correct answer – but for many solutions, many opportunities. Divergent thinking and out-of-the-box problem solving is crucial to the leaders of today and the future leaders of tomorrow, and we must recognize that this isn't just an innate ability. It's a whole mindset that can be taught, learned, and honed to shape the world around us. We can become better problem solvers, learn processes that help us develop our divergent thinking skills, and work to solve our own problems as well as those in our schools, our communities, and maybe even our world. Sign up to try PuzzleArt Therapy for yourself and begin to see the world and its problems in a new way. Preschoolers spend their days building with blocks, manipulating puzzle pieces, coloring, cutting, and learning to function in their world. While to them this is all just play, their brains and eye are engaged in important work, developing the visual skills that will help them succeed in school and life. At this unique point in child development, opportunities for growth and learning abound at every turn, and children ages 2 to 5 are fine-tuning the visual skills they developed from birth through toddlerhood, strengthening their focus, tracking, and depth perception skills. During this time, a child's visual perceptual skills are maturing to help them progress through a variety of childhood milestones. Preschoolers develop complex hand-eye coordination in order to learn to ride a balance bike or scooter while steering and watching where they're going. They must coordinate gross motor skills and visual skills in order to play a sport such as soccer, and they must develop the visual perceptual abilities and fine motor skills necessary for reading and writing readiness. While most children develop along the path of visual ability without issue, the preschool years present a critical point where vision problems occur. Prevent Blindness tells us that 1 out of 20 preschoolers have a vision problem. This is the time in vision development where conditions such as strabismus (crossed eyes, where one or both eyes turns inward or outward), amblyopia or lazy eye (characterized by reduced vision in one eye because the eyes and brain are not working well together), or refractive errors (such as nearsightedness or farsightedness) develop. Those conditions – amblyopia, strabismus, and refractive error – account for the most prevalent visual disorders in the preschool demographic, and all impact the development of visual skills. In order to provide preschool-aged children with a solid foundation, we must take steps to ensure normal visual abilities are developing so that their pre-reading skills leave them ready for reading and learning in school. Children will need matching skills, which requires visual discrimination; directionality, which incorporates a visual understanding of left to right and top-to-bottom; and letter-recognition skills, which involves visual processing and memory. One challenging piece of the puzzle is that children often do not notice there's a problem nor do they complain. Without a larger frame of reference, they assume this is how everyone sees and navigates the world. Any delays in development must be noted, as they may signal the presence of a vision problem and therefore, delays in the development of visual skills. If a child is having difficulty recognizing colors, shapes, or letters, they may in fact be experiencing a visual problem rather than a learning issue. Clearly, the stakes here are high: if a child is experiencing visual problems that are not addressed, he or she may enter the school system displaying developmental delays that could find that child labeled with a learning disability. This label and potential interventions would not solve the root of the problem and could add layers of other issues, such as social stigma and lowered self-esteem. Behavioral and developmental vision care can play an important role in correcting the visual deficits of a preschool-aged child. While glasses and vision correction may be one piece of the puzzle, vision therapy can prove just as important. When you're three, learning about the world is your main job in life. Since we all take in 80% of that world through our eyes, it is vital that any visual problems have been identified, and that the growing visual skills of the young child are properly stimulated and trained in order to help the eyes and brain communicate as effectively as possible. What if we could identify the primary cause of reading failure in school-aged children? Or pin down a treatable factor in academic and behavioral problems among at-risk students? What if we could reduce the misdiagnosis of learning disabilities or ADD/ADHD? What if I said, WE CAN. Because those issues, and more, often come back to vision problems. I'm not implying that every child who has been labeled with a learning disability or ADHD is misdiagnosed, but the reality is that one out of every four school-aged children have an undiagnosed vision problem. One out of four! To add to that, children typically don't complain of visual issues because they assume how they see the world is normal. Compounding the issue further, traditional eye screenings are often inadequate. The Snellen eye chart (developed in the 1860s) measures only what can be seen far away, and does nothing to evaluate a student's ability to see well up-close, which is critical in order to read books or computer screens, for example. The screening doesn't come close to evaluating peripheral vision, depth perception, eye coordination, color vision, or focusing ability. It also provides no information about whether or not the brain and the eyes are working together to process visual information. However, many students are overlooked for visual perceptual problems because they perform well on the eye chart. Students may even walk away hearing they have 20/20 vision, and they may think their eyesight is perfect. Changing this perception is crucial to helping parents, teachers, and students themselves be on alert for visual perceptual deficits that impact learning, school performance, and even behavior. An evaluation of the visual efficiency of beginning readers in a public school found that visual factors were the primary cause of reading failure and that most current school screenings are inadequate to detect these problems. A study of inner city youths found that poor vision is related to academic and behavioral problems among at-risk children. Vision problems are often typically misdiagnosed as learning disabilities or ADD/ADHD leading to special education intervention and unnecessary drug treatment of school children. Studies have shown that the correction of vision problems with vision therapy leads to significant reduction in visual symptoms and improvements in reading performance. Visual ability is fundamental to the learning process. Students must be able to see their books, computer screens, and the whiteboard, but they then need the visual skills to both understand and respond to what they are seeing. They have to be able to organize images into letters, words, and ideas that make sense, and then they must comprehend and retain those messages. Students have to be able to maintain their focus and not lose their place when looking between the board and their notebook, and they need to be able to judge distances and coordinate their hands and eyes in order to draw a picture or hit a ball. Clearly, students make use of a variety of visual perceptual skills throughout their school day, and in order to experience success both in and out of the classroom, those visual skills must be optimized. From the moment they wake up until they fall into bed exhausted at the end of the day, they are processing visual information. In fact, it's estimated that 80% of the information that our brains process comes from what our eyes take in. If students are experiencing a visual perceptual deficit (or several), it will impact their understanding and application of what they're supposed to be learning in this crucial time period, and may also lead to headaches, fatigue, and other eyestrain problems. Clearly, vision problems that go undetected and untreated leave students ill-prepared for school. Without the visual skills to succeed in the classroom, students are bound to be frustrated, act out, and experience delays and the need for special education. While Ptah may have been a bit melodramatic, most everyone has felt the weight of getting older. Who hasn't walked into a room only to realize they have absolutely no idea why they're there, or spent ages searching for an important something-or-other? Helping others combat issues of memory at any age is crucial to our success as practitioners. When memory lapses become more common, reaction times slow, or words don't come as easily, panic often begins to set in! But as we know, this is not an inevitable part of aging! People don't have to sit around waiting to forget what they had for breakfast! Recent studies demonstrate that working memory capacity, long thought of as a constant, can be improved through training. The changes in cortical activity after training could be evidence of training-induced plasticity in our neural systems. The connections between our eyes, brain, and working memory have powerful implications. Our brains process information all of the time, and we make decisions constantly about what to attend to and what to discard. 80 percent of the sensory information the brain receives comes through our eyes, which means we need to pay particular attention to being sure the eyes know how to take in what is being seen. PuzzleArt Skill Builders take participants on a guided journey through the perceptual learning field, providing perceptual activities that challenge and activate the brain, improving memory and cognition. It's vital for people to take an active role at any age and train the eyes to truly see and fully communicate with the brain. 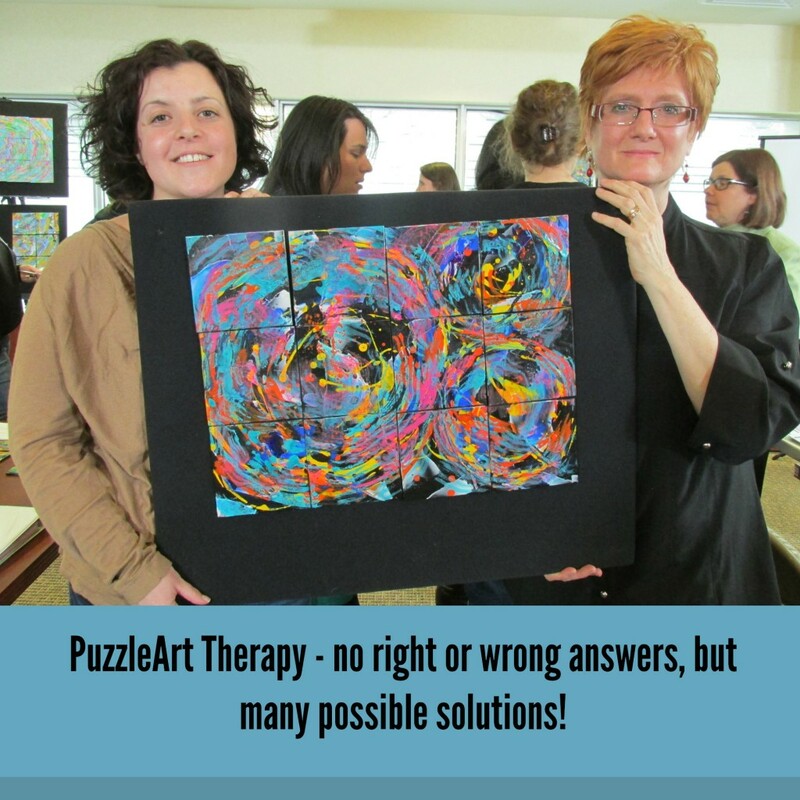 Check out the PuzzleArt Therapy Training for Therapists and Parents. Rewire Your Brain for Success! Do you remember the artsy kid in high school, sporting their paint-splattered clothes, Doc Martens, and bulging portfolio? Maybe you were that kid, or maybe you wanted to be that kid, but you felt you didn’t have a creative bone (or brain) in your body. Or maybe you sat in geometry class, hearing about how angle A was congruent to angle B, but not comprehending the material at all as you sat there convinced that you couldn’t master the subject because your brain just didn’t work that way. But what if you were wrong? What if you could rewire your brain? How might your life have changed if you had just been told that your brain is not locked in a set state, that it can grow and change? If you had known that you could optimize your brain’s organization for better learning, would it have altered your success in school, or even your direction in life? Maybe, or maybe not. But now students can have that card in their back pocket, or their front parietal lobe. Brain plasticity is one of the most exciting recent discoveries of neuroscience – and one with tremendous promise of real-world application. Brain plasticity refers to our brain’s ability to change and adapt in response to experiences. That is, we can provide our brains with learning opportunities that will force our brains to grow. As we strengthen our neural networks, we will thereby increase our memory, cognitive functioning, reasoning, and problem solving abilities. Our brains are not fixed, our intelligence is not set in stone! We can use the knowledge that our brains are malleable to change our neural wiring – but how can you rewire your brain? It turns out that one of the easiest ways to improve student outcomes in the classroom is to teach students that learning can change their brain, then give them the cognitive strategies to make that happen. When students realize that learning can alter both the structure and function of their brain, they gain a measure of control and personal ownership over their learning and their brain function. Using their cognitive and metacognitive toolboxes, students hammer away on learning and learning to learn, building a better brain in the process, and experiencing academic success as a result. Improving those neural pathways can improve our brain function. For example, researchers found that boys whose brains better integrated both their left and right sides showed specific giftedness in mathematics. Activities that engage different areas of the brain help us to problem solve in new ways and allow us to see the world through a new lens. Through those new neural networks, you are able to rewire your brain. 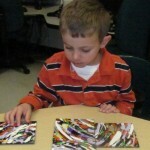 PuzzleArt Therapy uses a holistic integrative approach to help people improve their brain. This interactive art form utilizes brightly colored and highly textured PuzzleArt squares, and it provides participants with a hands-on experience that engages their mind and builds imagination. Participants explore new ways to problem-solve, and the activities help with memory, tracking, focus, and concentration. Practicing these skills in a fun, supportive, and creative environment helps build and reinforce those neural networks that are so vital to optimizing our brain functions! As students touch the pieces, explore their contours, and arrange and rearrange the pieces to form a multitude of solutions, they also create new, original art. The production of visual art is known to cause changes in our brains, and providing our brains with new experiences is exactly what helps develop neural connectivity and will help you rewire your brain. 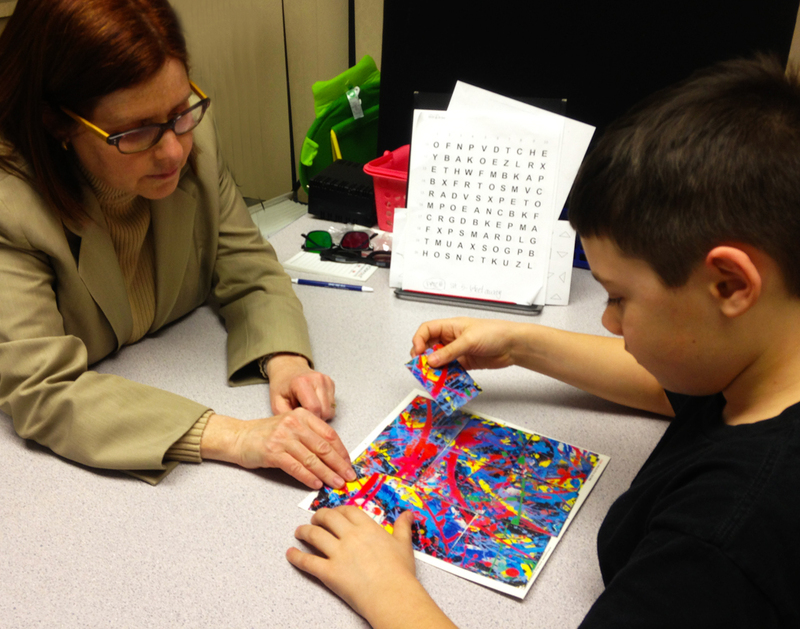 Student works on PuzzleArt Therapy Challenge Grid perceptual, oculomotor and sensory activities with behavioral optometrist, Susan Fisher, OD. We are seeing more and more that we have an integrated neural architecture, a large-scale brain network that is crucial for complex problem-solving. Training to rewire your brain in different modalities of reasoning improves our cognition, and acknowledging that our brain can change and focusing on how to make those changes, as simple as that sounds, can result in great strides – short-term academic advances or long-term life benefits!